GIO4TAD Team Conquers Heartbreak Hill! 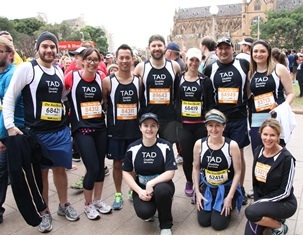 On a chilly Sunday morning a group of dedicated TAD supporters left their warm beds to take on the iconic City2Surf – 14kms including Heartbreak Hill. They came, they walked/ran and conquered and raised over $5,900. A special thanks to Alex Cortes from GIO for being our team champion and recruiting GIO staff to take on the challenge, and to Angela and Linda from Suncorp for arranging shirts and registrations behind the scenes. An a huge thank you to Nikolai for raising an amazing $2,145 and being our top fundraiser. It was a great effort from all and thank you from TAD Disability Services. You can check out some photos from the day here – feel free to tag yourself!